As much as many of us enjoyed watching the humiliation of Israel and PM Netanyahu in Washington this week, I am reluctant to suggest that the emerging crisis between America and Israel may also be a red light warning for all of us. The current crisis may lead to some devastating consequences as far as Palestine, Iran and the Middle East are concerned. It may be possible that the Americans have started to gather that there is no partner for peace in Israel. America clearly has had to shun its ‘kosher ally’. The American military and political elite already admitted this week that Israel is a strategic burden on the U.S. Seemingly, the only people who genuinely believe in the American Israel strategic bond are AIPAC and its list of obedient ‘Sabbath Congressmen Goyim’. But unfortunately, this is just one side of the story. A deeper reading of recent events would suggest that the latest American Israeli rift is actually led by Netanyahu’s political partners. Interestingly enough, as much as America reveals growing disapproval of Israeli policy, the anti American attitude, demonstrated by Netanyahu’s allies at home, is overwhelming. It doesn’t take a genius to grasp that some of Netanyahu’s cabinet members are doing everything in their power to fire up a storm between Israel and its ‘closest ally’. Interior Minister Eli Yishai, the man behind decisions that sparked the recent diplomatic crisis, said this week 'Israelis voted for this government's path, according to which, there will be no compromises on (the) Jerusalem issue'. He also used the opportunity to thank his creator for giving him “the right to be the minister who approves the construction of thousands of housing units in Jerusalem". Along with his latest disastrous visit to Washington, PM Netanyahu found time to consult with his Foreign Minister Avigdor Lieberman. According to Ynet, Lieberman advised his PM “not to capitulate in face of American pressure”. I guess that most political analysts fail to understand the depth of the Israeli right wing expansionist and racist conviction. Unlike Sharon, Peres, Livni, Rabin, Olmert, Barak and even Netanyahu himself, who along the years, paid a limited respect to the West and the US in particular, Netanyahu’s cabinet is dominated by right wing Zionist hawks. They follow David Ben Gurion’s old mantra: “it doesn't matter what the Goyim (Gentiles) say, the only thing that matters is what the Jews do”. Netanyahu’s political partners are not willing to compromise or acquiesce to American conditions. Netanyahu’s political allies are convinced that at least momentarily they will do better without Uncle Sam. They realise that the days of the ‘Jew-only state’ are numbered unless some radical moves are put into action. They grasp that unless the Jewish state implements measures that would push the entire Palestinian population out of Israel, the Zionist dream will come to its end and pretty soon. Those hawks also realise that once Iran gets a hold of a nuclear capacity, Israel’s ability to maintain its status as a ‘regional terror-inflicting power’, would disappear overnight. Netanyahu’s cabinet members grasp that if Israel wants to survive as a Jewish ethnocracy and a regional super power, Israel must confront Iran soon and ethnically cleanse Palestine of its indigenous population, in an act that will complete the objectives of the 1948 Nakba. Israeli hawks who currently dominate Netanyahu’s government and Israeli politics realise that a bond with America can only restrict and even jeopardize their sinister plans for the region. It is obviously hard to predict Israel’s next move. However it is crucial to remember that at the heart of the Zionist collective narrative we find Biblical stories like that of Samson, a tale of a suicidal genocidal character. Samson is the Jewish Hercules. He was granted some tremendous strength by God to combat the Jew’s enemies and to perform some ‘heroic’ feats unachievable by ordinary humans. 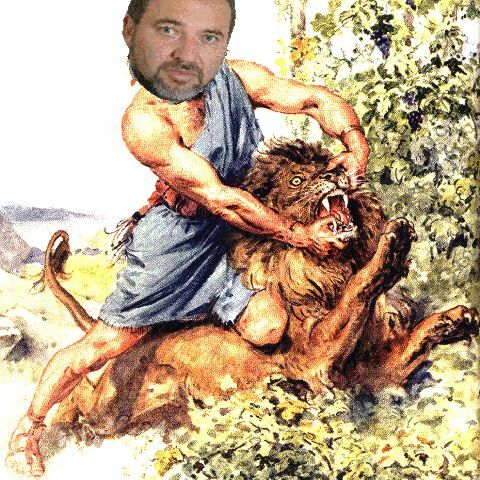 He wrestles a lion, he slays an entire army with only a donkey’s jawbone and eventually when the time is ripe, he commits mass murder. 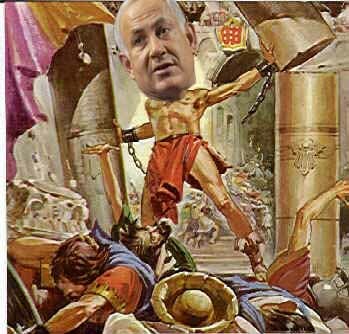 Single handedly he crushes a Philistine temple killing thousands, including the elderly, women, children and himself. I do not know whether Lieberman regards himself to be the new Samson. Looking at his recent picture, he is probably not fit enough to fight a lion. However, the genocidal tendency together with suicidal inclination is absolutely there.